London South Bank University (LSBU) held a series of events as part of Global Entrepreneurship Week (GEW), a world-wide celebration of all things enterprise from 16-20 November. 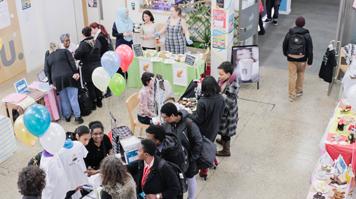 Students, graduates and staff took part in a variety of events, talks, workshops and competitions held by LSBU’s Entrepreneurship and Innovation Institute and the London South Bank Students’ Union. Over 580 students, staff and LSBU graduates took part in GEW. Student and graduate entrepreneurs sold their wares at a pop-up market in the Student Centre which turned over £1,258. The week included a number of inspiring talks by successful entrepreneurs and start-up experts. Prominent tech entrepreneur and LSBU alumna Dr Sue Black spoke about how technology and education changed her life. At a panel discussion, a group of recent graduate entrepreneurs shared their experiences of starting businesses while studying at LSBU. Students took part in a number of competitions as part of GEW. Part of LSBU’s Ignite Intellectual Property (IP) awareness project, the Cartoon Challenge inspired students to create illustrations of famous IP legal cases. The winning prize went to BSc Baking Technology Management Rebecca Brown for her cartoon of the Starbuck ‘Duffingate’ case. GEW concluded with a celebratory wrap-up event, where finalists in LSBU’s business idea pitching competition presented their business ideas to a live audience and panel of judges to win £500. First prize went to MSc Food Safety and Control student Mary Domingo for her proposed insect-based cereal product. “It’s great to see more and more students at LSBU getting involved in enterprise, whether they want to be entrepreneurs, freelancers or just want to develop new skills. Our GEW events have really shown us the strong drive and innovative ideas our students have,” said Linsey Cole, Head of the Entrepreneurship and Innovation Institute. Other GEW events included practical workshops on succeeding at freelancing and how to build a business out of nothing. Find out more about Student Enterprise support and activities at LSBU as well as the Ignite project.